Tag Archives for " inbound selling "
The title of today’s post became one of the major sub themes of my upcoming book Duct Tape Selling. It didn’t start out that way, but in working with more and more sales departments it became clear that the move to inbound and social selling occurs much more effectively when there’s a culture of cooperation and integration within sales and marketing departments. Sadly, this is rarely the case. In fact, I’ll be presenting my view of the sales and marketing divide – and what to do about it – in an upcoming MarketingProfs Pro Seminar. My take is that for organizations to take full advantage of the dramatic shift in the way people and organizations buy today they must intentionally blend inbound marketing, outbound marketing and inbound selling a way that mirrors today’s customer journey. Sales and marketing must come together at the point where awareness and messaging and the very definition of what an ideal client actually looks like initiates. Below are five activities that I believe should be at the forefront of any attempt to more closely align sales and marketing. Quite often marketing creates a plan and calls on others to deploy it. The challenge is that in most cases the marketing folks are isolated from the actual customer. Sales and marketing must come together to define the customer, create marketing strategy and map a customer journey that puts the customer first. Invite sales into the planning phase! Marketing is now in full content production mode. But I wonder if more is really better? I believe that even if sales people aren’t asked to write blog posts they can both inform the editorial make up and personalize what content is produced in ways that will make it more useful to individual prospects and clients. Marketing must take the access they generally have to data and filter content to help sales professionals spend less time researching. Here’s an idea that is causing loads of angst in marketing departments around the world – turns out that social media is more effective in the hands of some sales professionals than it is in the hands of some marketing professionals. While far too many marketing departments view social media as another broadcast channel, smart sales folks are finding better ways to connect, network, prospect and engage very small numbers of the right people via social media. This is a huge training opportunity. To me the item that would really bring a sales and marketing group together would be the act of jointly engaging a client or prospect. This could start with working on a proposal together, making calls together, blending lead nurturing activities and, with the inclusion of a service or account manager, might just round out the perfect way to engage today’s buyer. Here’s the real problem. Many marketing departments are measured by the number of leads they generate – no matter the relative quality. Sales is measured by the number of those leads they convert – no matter the relative quantity and quality. Suffice it to say neither is too happy. If you want to get sales and marketing really working together set up a way to measure the true impact of effective inbound marketing and selling as a team and reward each for the vital role they play in actually creating a profitable customer. If you liked this post, check out our Small Business Guide to Sales. In my forthcoming book Duct Tape Selling (Portfolio May 15th) I make the case that sales professionals must think and act more like marketers. In doing so, I lay out the systems and tools I believe they need to employ in order to make this shift. The fact that selling must take on many of the attributes of inbound marketing is inevitable and is already being embraced by a growing number of firms. One of the things that I’ve encountered as I’ve begun to evangelize this evolution is the fact that cultural resistance to this change is huge. By that I mean that many sales leaders see the idea that sales teams would be asked to create content and participate in social media engagement as a waste of valuable “selling time.” Many sales people, often measured and compensated on closed deals, see inbound selling tactics as more work for less pay. Many marketing leaders shudder at the idea that sales teams might be turned loose to do things that might impact the brand in ways that cannot be controlled. But here’s the problem. The market doesn’t care that you’ve got a dysfunctional cultural attachment to the way it’s always been. The market has changed, the way people want to buy has changed and you’ve got to change with it. I believe that facilitating this change and teaching organizations how to integrate inbound marketing, outbound marketing and inbound selling is one of the most exciting opportunities that exists today for leaders, trainers, consultants and coaches alike. Marketing will never be an integrated function until sales is using inbound strategies and tactics as an extension of and in conjunction with marketing. I do see some sales teams becoming a little more inbound right now in one of three ways. Rogue sales people are creating content, employing social media and building authority on their own out of desperation. Sales departments are beginning to offer crude versions of “social selling” training, which often begins and ends with how to mine LinkedIn for leads. Marketing departments are reaching out to their sales teams asking them to provide blog posts for the company blog. I suppose any of the above is better than “always be closing,” but they miss the potential of this shift in business by miles. In my opinion an inbound selling plan, along with the strategies, tactics and training to implement this plan, should flow directly from the inbound marketing strategies, tactics and training already in place. (Of course I realize this makes some assumptions.) This is not to suggest that marketing should dictate what inbound selling looks like, but it certainly should have a hand in orchestrating the integrated efforts. This is the only way to create an overall experience that meets the customer on the journey they want to take. The shape this plan takes will depend largely on the size of the task at hand. If an organization needs to overcome a long standing divided sales and marketing culture, the work required will be significant. In these instances, it might be wise to start small with a pilot program that might gain traction without causing so much initial disruption. If your organization has already come to realize the need for this change, it might be as simple as creating several new processes that make it easier for sales to curate, personalize and share content. 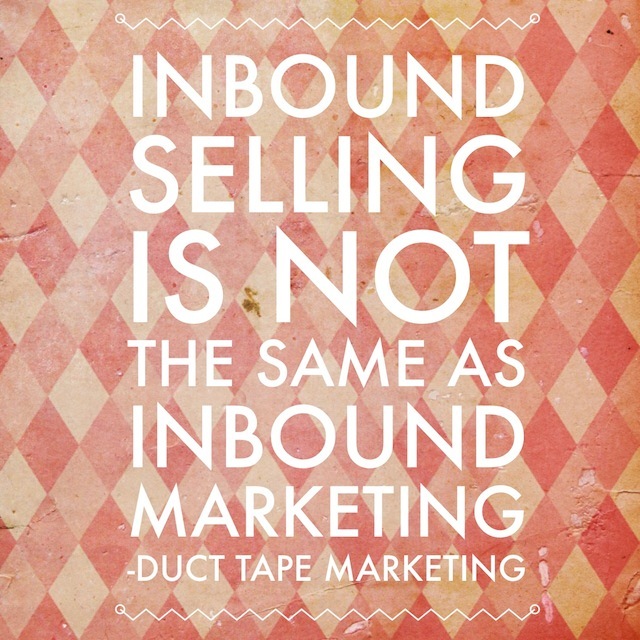 Know this however; inbound selling is not the same as inbound marketing. 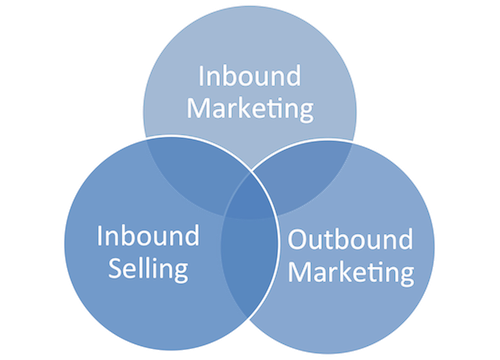 Inbound selling is the act of taking the information and outreach created by inbound marketing efforts and tailoring it in ways that creates insight for the individual customer or prospect. Social selling is the act of discovering ways to go deeper into the network of individual clients in order to provide more useful connections and engagement on a case-by-case basis. For example, marketing may create a series of blog posts detailing emerging trends in an industry and the individual sales person might access quotes and comments from those blogs posts to write individual email answers to prospects or provide individual updates to select prospects. Marketing may turn these insights into a research study or white paper and the individual salesperson might take the ideas and curate additional content relevant to the industry and operation of an individual prospect. Facilitating this change is the next social media gold rush. As I’ve outlined in previous posts and in recent presentation, I believe the most potent approach to marketing and sales involves inbound marketing blended with inbound selling. The challenge in implementing such an approach is that it requires an environment of intense cooperation between marketing and sales. As anyone in business can attest, this doesn’t always exist. But if marketing and sales simply adopt parallel inbound approaches, without total harmony, they can actually further the internal working gap and muddle the ultimate message heard by the market. What if you adopted an approach that took your organization in a direction that not only put sales and marketing on the same team, but also did so in a way that truly put the customer first? What if in place of giving this idea lip service, you broke your marketing, sales, support and service teams into small units and compelled them to go to work on individual client segments or specific accounts as self managed action teams. One potential way to set up such an arrangement would be to assign team leaders and rotate each member through the role of leader every 60 or 90 days. This would put accountability and autonomy directly on every member of the team. The result would be a shared result owned by all with no ability to point fingers and pass blame. If you were to facilitate this approach you might be quite amazed by the culture of collaboration that forms. Certainly, in your role of coach, you’ll need to guide these teams in the most productive ways, but this is how your create the kind of communication that leads to real innovation and you just might find that this changes your entire business model. The way to ease into such an arrangement is to start bringing your sales team members into marketing meetings to share what they are hearing out there on the street. You might even go as far as requesting that the marketing department develop some questions to begin posing to clients and prospects as a way to collect meaningful data on the client’s real world. The next logical step is to ask members of the marketing, service and support teams to participate in routine “ride alongs” with sales reps to make calls on clients and prospects with an eye on better understanding the world of sales while engaging in valuable conversations with actual clients. The first step in getting sales and marketing on the same page is to inject a bit of empathy. When team members gain a better understanding of each others objectives and challenges they are often more prepared to look for collaborative solutions to customer challenges. This step alone may turn up some more customer friendly processes and touchpoints, but to make these new learning pay off you need to create cross functional teams charged with blending inbound marketing and inbound selling. Once your teams start blending objectives and collaborating on behalf of prospects and customer it’s time to go to work finding and documenting the best practices and successful processes that these teams inevitably develop and using this approach to build a truly personalized customer oriented marketing and sales methodology.